Summary Smart Home Hub supporting a wide selection of Zigbee, Z-Wave, and Wi-Fi sensors & devices. Whether you call it Smart Home or Home Automation, an increasing number of companies want your business. But the SH/HA market remains fragmented. So decisions you make for your first purchase will, in many ways, determine what you'll be able to do with your SH/HA in the future. The software that ties all the devices together is the most important component of a Home Automation system and support for a broad spectrum of home automation devices is key. 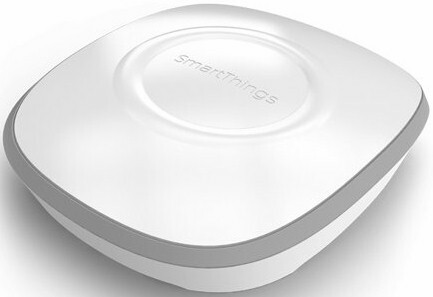 Like many new SH/HA companies, SmartThings started on Kickstarter in summer 2012. It made it successfully to market in 2013; so successfully that it was acquired by Samsung for $200 M in August 2014. So far, Samsung seems to be keeping to its agreement to let SmartThings operate independently. SmartThings seems to realize the importance of system software and broad device support, emphasizing "one simple app" control in its marketing. And its Compatible Products page has an impressive number of devices, enough to require sorting by category and filtering by brands and protocols to help you find supported devices. As with most Home Automation systems, the heart of the system is a Hub. The SmartThings Hub, shown above, requires a wired Ethernet connection to your home network. It communicates with sensors using built-in ZigBee and Z-Wave radios. It also can link to devices via your network's Ethernet and Wi-Fi connections. While these methods allow connection to a significant number of sensors types and brands, other Hubs such as the Staples Connect and Wink Hub also support Bluetooth and Lutron Clear Connect. In this review, I'll be taking a look at the SmartThings Hub ($99.00), SmartSense Motion Detector ($49.00) and SmartPower Outlet ($55.00). SmartThings offers several money-saving starter kits that bundle a Hub with additional sensors, like the $199.00 Smart Home Starter Kit that includes a Hub, motion, Open/Closed and Presence sensors. You can purchase SmartThings products either from SmartThings directly, or Amazon's SmartThings Store. The inside photo of the SmartThings Hub was grabbed from the FCC ID filings. There are also a nice set of photos by Ashu Joshi in this flickr album. As noted earlier, the Hub has ZigBee and Z-Wave radios. It relies on your router to connect to Ethernet and Wi-Fi based devices,. The California Eastern Labs (CEL) module uses a Silicon Labs EM357 transceiver chipset and has 192 KB of flash and 12 KB of RAM inside. Like most Home Automation products, setting up the SmartThings Hub is trivial. The printed Quick Start Guide instructs you to point your browser to www.smartthings.com/start. The setup instructions are so short and simple that I've included a screenshot below. Virtually every Home Automation system requires you to create an account to communicate with the product's back end servers and SmartThings is no exception. The entire setup is done within the mobile application. The app guides you through connecting your Hub to your Ethernet network and connecting the Hub to power. As part of the setup process, the app asks for permission to access location services, lets you choose a background photo for the UI and asks you to set the location of the Hub on a map. This help SmartThings determine your time zone. The setup step instructs you to enter the six character Welcome code that is on the start of the "Let's get started" guide. My setup experience was nearly flawless with one exception: I received an error code after entering in the Welcome code. We purchased our refurbished review sample from Amazon and the Hub had been previously registered to another account. While the device was reset to factory defaults, the device still needed to be disconnected front the previously-registered account. SmartThings does not offer telephone support, but my email to their tech support was answered promptly. Before clearing the account, the support engineer asked me for a photo of the bottom of the unit showing the bar code and serial number. That's a good security precaution. Shortly after I emailed the photo, I received a notification that the link to the previous account was cleared and the Hub connected to my account as expected. Once Hub setup is complete, you are ready to start adding sensors. I wanted to try out a couple of non-SmartThing devices in addition to the two ZigBee SmartThings sensors I had (Motion and Power plug). So I factory reset a WeMo Smart LED ZigBee bulb and two GE-Link LED Z-Wave bulbs. SmartThings lists the WeMo bulb as supported by the SmartThings app, but not the GE bulb. But SmartThings' support site said the GE-Link bulb should also work. It did, and I added two GE-Link bulbs. As I have noted in other SH/HA reviews, I checked whether the SmartThings system could function without a working internet connection. And like all systems tested so far with the exception of Belkin's WeMo, SmartThings stopped working when the internet connection went down. The company seems to recognize this as a weakness. According to this blog post, its V2 Hub will support "certain automations" when the internet dies.